Match action during the Sky Bet Championship match between Brighton and Hove Albion and Burnley at the American Express Community Stadium, Lewes, Falmer, England on 2nd April 2016. Peter was born in Oxford, taking up the Euphonium with the City of Oxford Silver Band in 1968, but moved to the trombone “who wouldn’t?”. He later played with the National Youth Orchestra for three years, also featuring on bass trumpet at the Proms on a couple of occasions. He has been solo trombone with Horsham Borough Band, Uckfield Concert Brass and now with LGB Brass. 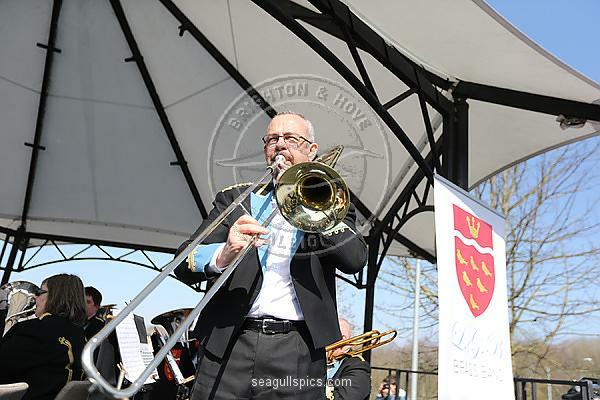 For over 20 years, he has been principal trombone with the Sussex Symphony Orchestra. Peter also leads a ten-piece orchestral brass ensemble called “Harveys Brass”, together with a trombone sextet called “Slideshow”. He can be found playing regularly with other orchestras and pit bands, he also tutors the South Downs Youth Orchestra woodwind and brass sections during term times, as well as dabbling in brass and piano composition when the mood suits. In the real world Peter retired after 31 years as a Police Inspector in Sussex, he now works for Sussex Police as a project and inspection officer in Criminal Justice. He has played cricket for Alfriston village for 20 years and is a regular England cricket tourist with the Barmy Army. Peter is Chairman for LGB Brass.